of as much information as you want. However, I found that the format makes it unclear where to find specific information. Horseheads High School’s Library Media Centre acts as an online catalogue for library resources, but I want my website to offer more than that. For my own website, I decided to stick with WordPress, not only because it will save me from having to completely reinvent it, but I like the format. I like having a blog to highlight things happening in the library, as well as pages for more permanent information. I find pages make it easier to organize that information for easy retrieval. The theme – I switched from the Coralline theme to the Adventure Journal theme. I find the new theme more visually appealing and complementary to my vision for my website. Blog page – I figured out how to embed my Animoto video into the page instead of just having the link. I added a Twitter feed, and Goodreads to showcase recommended books. About Your Library page – I made an iMovie of the original pictures, created a Vimeo account to upload the movie and then embed it into WordPress. Research Tools – I included links (with graphics) for the Works Consulted page, and Publishing Your Work page. For Wikipedia 101 I learned how to create an instructional video using Quicktime Player, which I then uploaded to Vimeo and embedded it on the page. I linked the Plagiarism page to an online tutorial. I shortened the Five Ws (and one H) of Cyberspace and linked to some websites as a starting point for creating a lesson for students. EAL Resources – I created a Parents and Students page with some useful links for resources outside the school community. Teachers – I added a Visual Literacy page with a link to my Evernote notebook listing picture books that can be used to support content at the high school level. This list was my final project for LLED 446. I am happy with the changes I have made so far, and think I have a pretty good start on what I eventually want my library website to look like. There have been many challenges the last couple of weeks as I have updated my website. The first being just getting used to using WordPress again to create/edit a website. Because I switched themes I had to reorganize a few things, and I figured out how to reorder my pages to create a menu I liked, not just the default, alphabetical one WordPress put them in. Another challenge was embedding my Vimeo videos onto my pages. The instructions on WordPress didn’t work for me, but looking online I found other instructions that helped. However, I have to say my biggest challenge with technology was making my Wikipedia tutorial. Creating the tutorial took me outside my comfort zone as I have never done one before and though I am comfortable teaching in front of a class, I have never really listened to myself speak. Plus the information I originally had on the page from Media Smarts seemed outdated, so I spent some time on the Wikipedia site, searching different topics and creating my own lesson of how to evaluate one of its pages. Once I figured out what I wanted to say, I searched the Internet for advice on making an instructional video and found a tutorial describing how to make screen recordings using QuickTime Player. As I have this on my computer I decided to try it first. After many hours I finally had my tutorial completed to my satisfaction (not completely happy, but satisfied). I lost track of how many screen recordings I attempted, though on the positive side I certainly got used to hearing my own voice. The more I use technology, the more I realize that it is not as intimidating to use as I once thought. Online platforms make it easy to create and share your work and ideas, and if there are challenges, there is a lot of online help available. My own website will remain a work in progress, and I look forward to discovering new digital technologies to enhance the virtual space of my library. 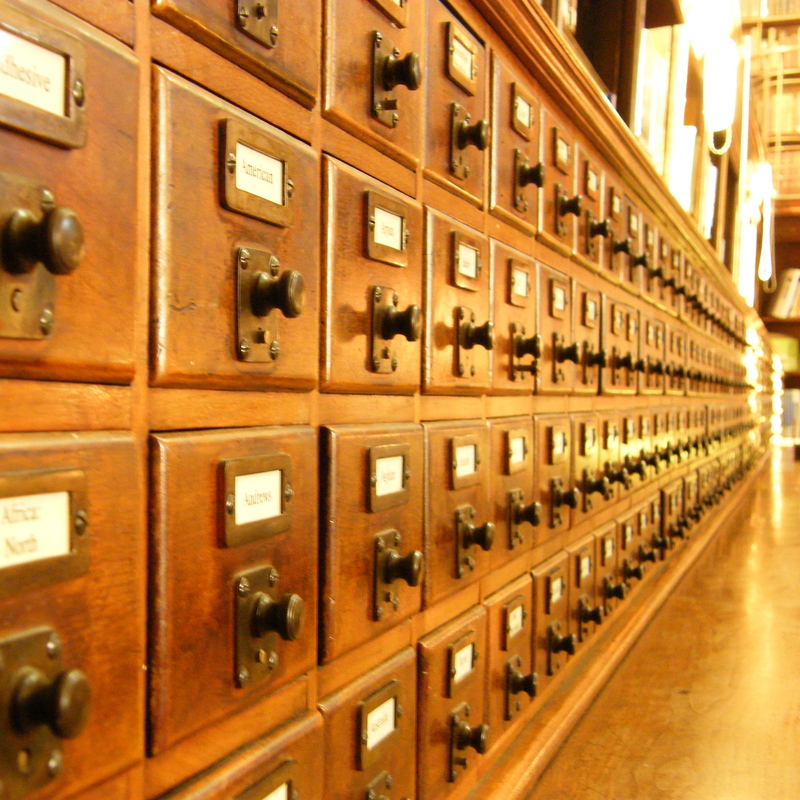 Within a generation of users, libraries have changed a lot. In order for school libraries to stay relevant to the digital natives of today, they require virtual spaces to go along with their physical ones. Looking at the library websites of the schools in my district I noticed a lack of virtual spaces designed to meet the needs of their school communities. I want to make sure that as a digital immigrant, I can create something I will be able to use for my own future library. I believe a website is an important part of the library space, so that is why I chose to concentrate on improving the one I had previously created . As I have been working on creating more content for my website, I have been asking myself many questions. Foremost in my mind is what do I want my website to accomplish and what technology do I want to use to add to my existing site? As this blog post is about my reason for creating a website and who I am creating it for, I will start there. 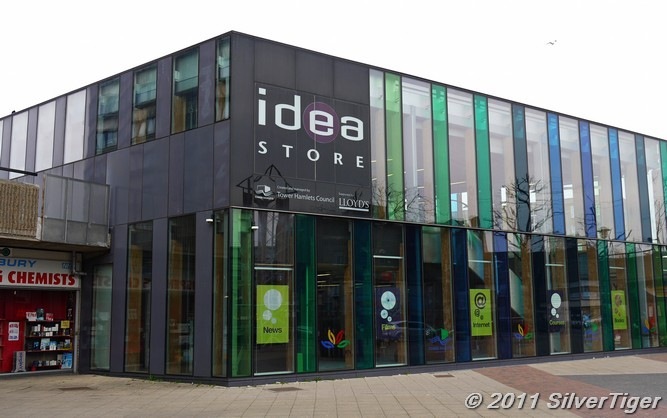 My original vision when I first put together a library website was to create a virtual space that would complement the physical space of the library. I wanted to allow students to have access to library services whenever they needed them as well as encouraging them to use the physical space. This rationale is still part of my vision. Students are used to getting the information they need whenever they choose, so for school libraries to remain useful to their primary users, they need to provide services outside the limited hours of a physical space. However, I think the physical space of the library is still a very important part of the school community and a library website can be used to encourage students to utilize this space by highlighting new books, services available, or events happening there. 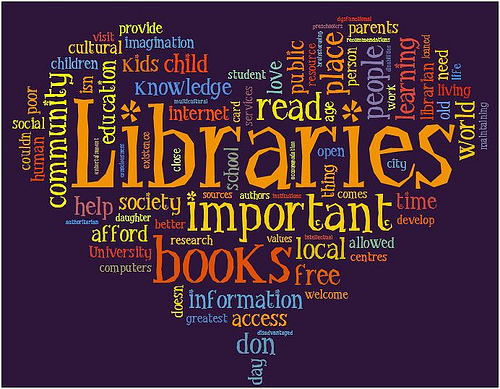 It is obvious that a library website needs to benefit students, but teachers, support staff, administration and parents are also an important part of the school community. Should I be including content aimed at these members as well? Besides students, teachers are usually the next biggest users of school libraries and I think a school library website should offer something for them as well. The one I have created does have a page on which I want to provide resources for teachers. I also think it would be beneficial to include resources for support staff, EAs, TAs, SEAs etc., but I am not sure what they would need. Once I get my own library, I might try to find out their information needs and see if I could include content to support them. A main goal of administration is to provide a school environment that ensures students’ success, so by providing a space that meets the needs of students and teachers I would help them meet this goal. If I was creating a website for an elementary school I would probably include some resources for parents. When children are young, parents are encouraged to support their child’s literacy and learning, and resources to help them do that would be helpful to them. However, parents are usually not as involved in the school community at high school so I am not sure if it is as important to include resources for them on my website. However, once I get my own library, like with the support staff, I may ask if there is anything they would like to see for themselves in the library. As a TTOC I have had the advantage of working in many different school libraries and I have observed that their content and services are generally geared toward students and teachers. Therefore, before updating my own website I decided to take a look at some other school library websites to see if they reflect this. 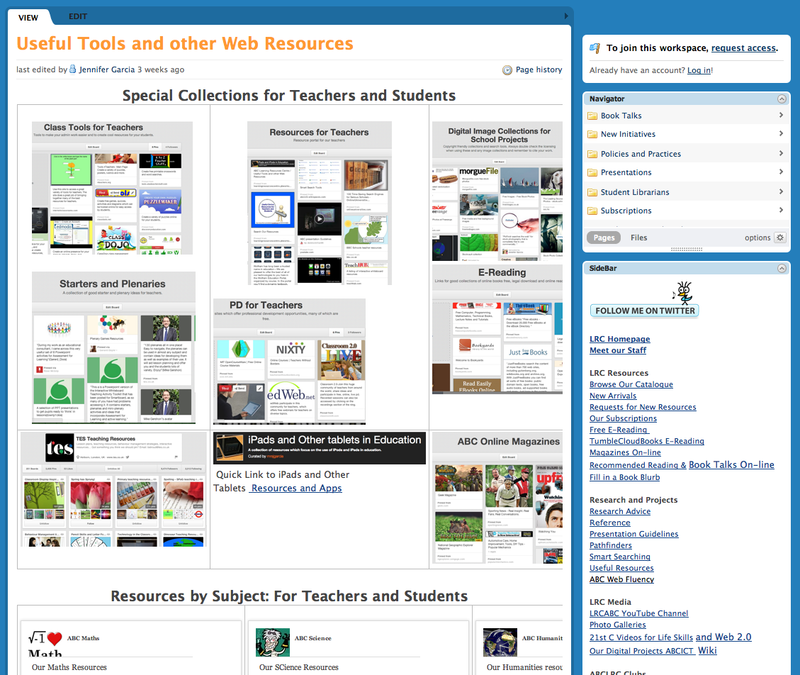 The School Library Websites wiki provides many examples of websites created by teacher-librarians. I focussed on the high school examples, as that is the level of my website. For the purpose of this assignment I concentrated on the websites’ intended audience. Not surprisingly, the primary audience of all of the websites I looked at was students. They usually had an area for teacher resources as well, though this was often not immediately apparent. 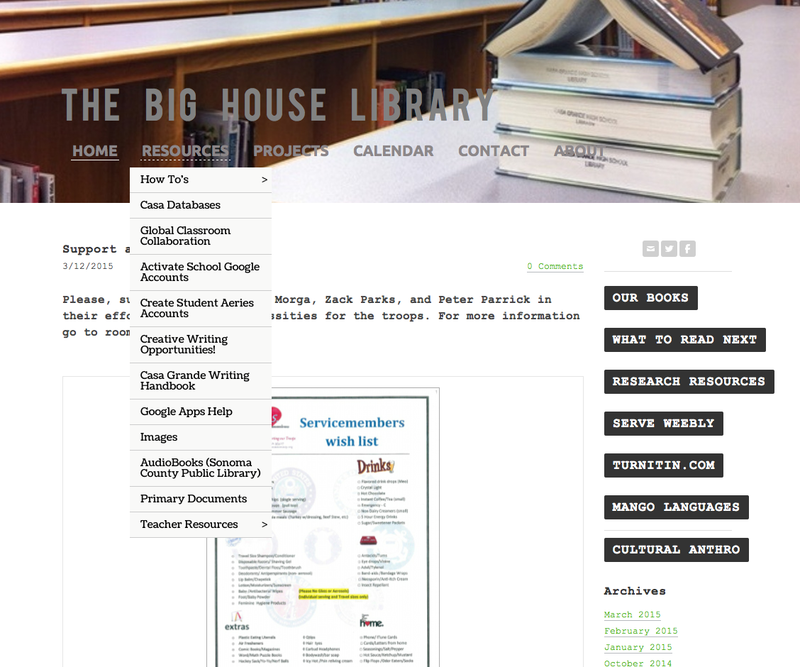 The Big House Library has a section for teacher resources within the Resources tab. It is easy to get to, but it is not obvious from the homepage that there are teacher resources on this site. 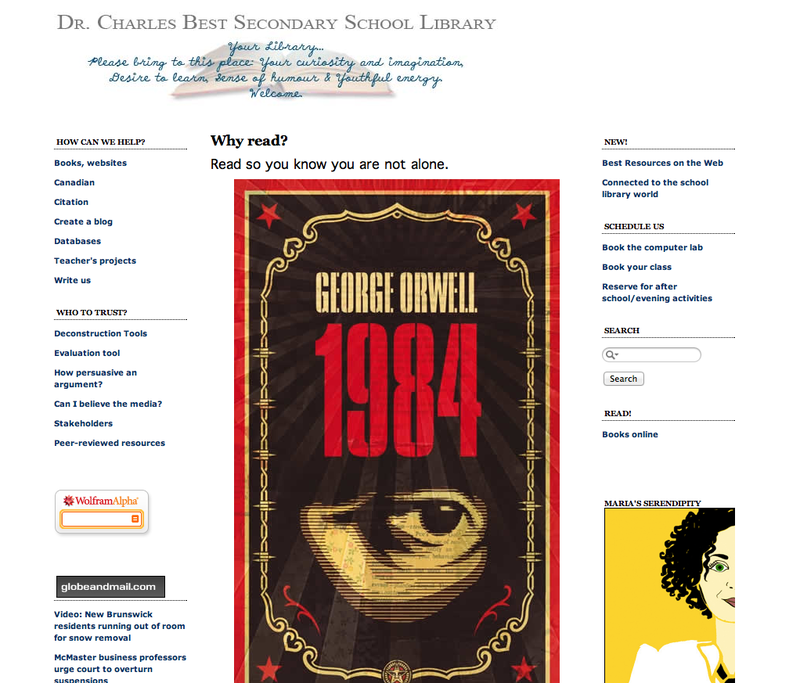 Dr. Charles Best Secondary, a local Coquitlam high school, has a variety of resources for both students and teachers. However, I did have to search for the ones for teachers. The New section has lots of website links (for students and teachers) and lesson plans (for teachers). The Stakeholders page has a lesson plan for teachers though it is on a sidebar with other resources meant for students. The ABC Learning Resource Centre from El Salvador, does have a page on its wiki that contains resources for students and teachers, though again I had to search for it. The page is simply listed as Useful Resources. Not including the ones that were simply links to online catalogues, all of the websites I looked at were similar in terms of what resources they provided as well as their intended audience. For my own website, it makes sense to focus on highlighting resources and services for students, while still providing resources for teachers. However, unlike many of the websites I looked at, I want to make it clear from my homepage where the teacher resources are. I also want to make sure that my library’s virtual space is not separate from the physical space but instead complements what is provided there. I am looking forward to creating some content that will be useful for the future users of my library. What can I create to highlight the vision I have of my future as a teacher-librarian? The question comes at an appropriate time as this will be my last project for my last course for my Teacher-Librarian Diploma. 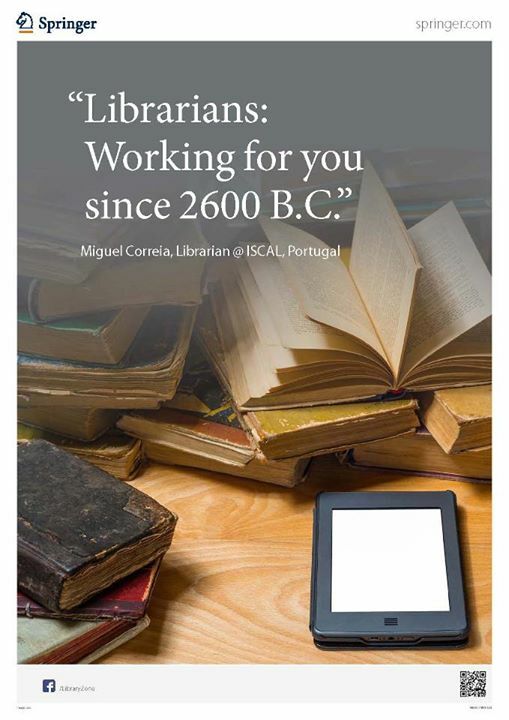 Reflecting back on this course, as well as the others I have taken, I have learned a lot about what it means to be a teacher-librarian in the 21st century. I think the main thing I have learned is that leadership is a big part of a teacher-librarian’s role; leadership in literacy, professional development, advocacy, information literacy, digital literacy skills and the ability to create a welcoming place for all within the school community. As a TTOC my future is uncertain. I don’t know where or when I will have my own library. On deciding what platform to use to showcase my vision I need to think about my goals as a new teacher-librarian. Initially I would want to create a welcoming space for staff and students, highlighting the library services my program can offer them. In terms of digital technology, to me this means creating a library website. A website gives library users access to library services 24/7, while highlighting what the library has to offer both virtually and physically. However, for one of my courses last year, LIBE 465, I created a library website as my final project, but I took a look at it this week and realized that there is a lot I could do with it for this course. When I created it, the goal of the assignment was to focus on information architecture not content. Consequently, it is pretty bare bones with little digital content I created myself. There are some pages listed as “under construction” with ideas about what I would like to do with the space. Others are pretty text heavy, but I wasn’t sure at the time how I wanted to convey the information. You can read about my reflections on the process I went through on my blog. I can now think of a number of ways I would like to update the content using digital technology, creating an artifact that I could use once I get my own library. 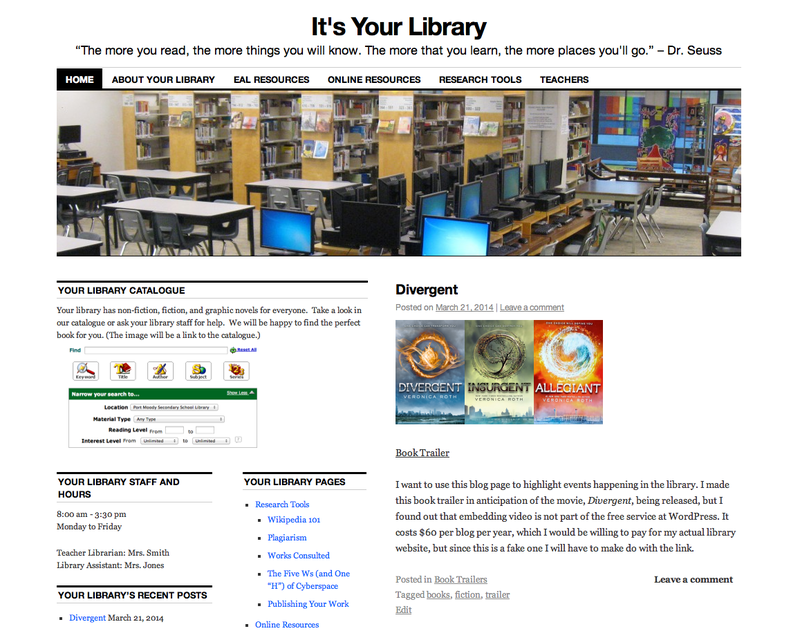 About Your Library page: my purpose for this page was “to link the physical and virtual spaces of the library.” Instead of static pictures I think it would be more effective as a slideshow or movie to highlight what users can expect from the physical space. Research tools page: these pages are text heavy and offer a good opportunity for me to create an instructional video which I have never done before. Teachers page: as this page states, I plan on having resources for teachers concentrated here. I could maybe start with something about visual literacy (the topic for my reading review). Perhaps creating something to showcase ideas for using picture books in the classroom. Homepage: I would like to keep this page as a blog to highlight events happening in the school and wider community. I don’t really like the set up as it is, and it seems like a good space to add more social media components. I don’t know if I will be able to accomplish all these changes for this project, but I am looking forward to doing what I can. Even though this is a “fake” library website, I am confident I can create content that I will be able to transfer and use once I am running my own library program.